When a team of scientists delivered the gene for a retinal opsin into the genome of the ganglion cells of blind mice, the mice acquired vision that lasted a lifetime. The work was published on March 15 in a paper titled, “Restoration of high-sensitivity and adapting vision with a cone opsin,” in Nature Communications. Retinal degenerative diseases cause progressive loss of rod and cone photoreceptors, leading to blindness. Although the intact downstream retinal neurons can be targeted for optogenetic therapy, those approaches have been limited. The researchers found that the vertebrate medium wavelength cone opsin (MW-opsin) overcomes certain limitations and supports vision in dim light. Normally, this opsin is expressed only by cone photoreceptor cells and makes them sensitive to green-yellow light. 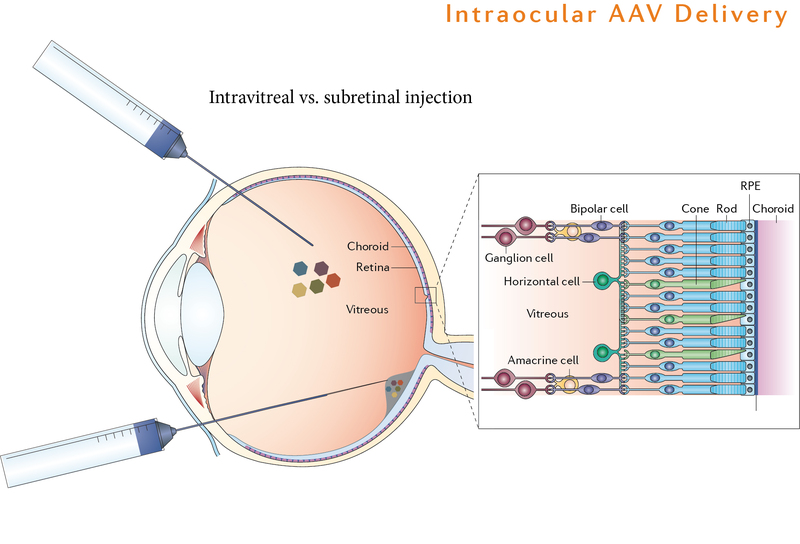 The researchers designed an adeno-associated virus (AAV) that naturally infects retinal ganglion cells and loaded it with the gene for the green MW-opsin. When injected into the eye, the virus carried the gene into ganglion cells, which normally are insensitive to light, and made them light-sensitive and able to send signals to the brain that were interpreted as sight. In their trials in mice, the UC Berkeley team succeeded in making 90% of ganglion cells light sensitive. The previously blind mice acquired vision that lasted a lifetime. 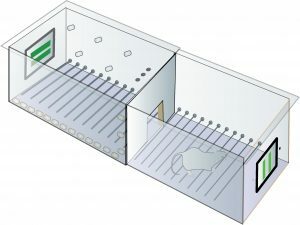 The MW-opsin enabled an otherwise blind retinitis pigmenotosa mouse to discriminate temporal and spatial light patterns displayed on a standard LCD computer tablet, displays adaption to changes in ambient light, and restores open-field novel object exploration under incidental room light. They were able to see motion, brightness changes over a 1000-fold range and fine detail on an iPad sufficient to distinguish letters. 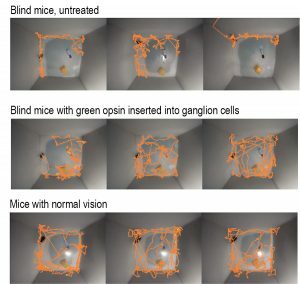 The researchers say that, within as little as three years, the gene therapy—delivered via an inactivated virus—could be tried in humans who’ve lost sight because of retinal degeneration, ideally giving them enough vision to move around and potentially restoring their ability to read or watch a video.